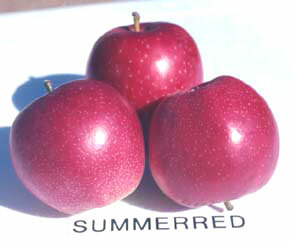 McIntosh × Golden Delicious seedling, Summerland Research Station, British Columbia, Canada. Moderately vigorous, upright spreading, spurring freely. Moderately susceptible to scab, moderately resistant to mildew. Delicious, Golden Delicious, Fuji, Bonza, Egremont Russet, Idared. Attractive red crimson all over, light-brown lenticels, smooth, can be greasy. Crisp, white flesh; juicy, sweet with acid flavour.